SUFFRAGETTE is a handsomely made film about the ordinary women who campaigned for their right to vote in early twentieth century England. It features a great ensemble cast and is well-written by Abi Morgan (THE IRON LADY). Carey Mulligan stars as Maud Watts, a young washerwoman who gets drawn into the suffragette movement at just the point where it morphs from lawful protest into militant civil disobedience - throwing rocks through windows, blowing up post boxes and cutting telephone wires. It’s also the moment where police surveillance becomes more concerted, with the use of new tech - more mobile cameras - and infiltrators. We follow Maud as she meets women from all walks of society - from the abused housewife and factory worker played by Anne Marie Duff to the middle class pharmacist played by Helena Bonham Carter to Romola Garai’s politician’s wife. We even get a cameo from Meryl Streep at the very centre of the film, playing Emmeline Pankhurst, exhorting her foot soldiers to militant action. What I like about this movie is that it could have been a very straightforward earnest piece of political agitprop, focused on the big names at the top of the movement. It also could’ve just focussed on the horrors to which these women were subjected. And it certainly doesn’t shy away from them - there’s a devastatingly violent and rightly traumatic scene of Carey Mulligan’s character being force-fed. But alongside the big historical beats, Abi Morgan also focus on the subtle relationship drama, as we look at the impact of the choice to be militant on the women’s families. So, we see the politician (Samuel West), acutely embarrassed by his wife’s activities, bailing her out with her own money. Because, after all, this is a period when a wife is the property of her husband, when her fortune transfers to him, and when her children are his to dispose of as he wills. I love how Abi Morgan subtly etches this financial truth in a swift but devastating scene. We see the pharmacist’s husband support her activity up until the point of it ruining her health, whereupon he also feels entitled to save her from herself. We see Anne Marie Duff’s character, Violet, violently beaten and knocked up again - showing us swiftly and quietly how a women’s fertility was also subject to her husband’s whims. But the most fascinating relationship study is that between Maud and her husband Sonny, played with characteristic nuance and sympathy by Ben Whishaw. Here’s a man who acts in a manner that seems callous to modern audiences but which is utterly understandable given the context in which he has grown up. He simply cannot see why his wife has to cause trouble or why she should look for something different in life. He thinks he is acting for the best in his own narrow-minded way. The result is a movie that is perhaps quieter than I might have expected but which resonates. If I have any criticism is that I would have wanted more time with Emily Davison (Nathalie Press) to understand her movement-changing decision. And while I don’t blame the screen-writers for making her motivation more clear-cut than the historians might argue was the case, it does make for a simpler film. Also, and this really is a small gripe, while Meryl Streep is typically grand as Emmeline Pankhurst, it did feel a bit like stunt casting. But I can hardly blame them for harnessing her star power to get this complex film about women by women made. 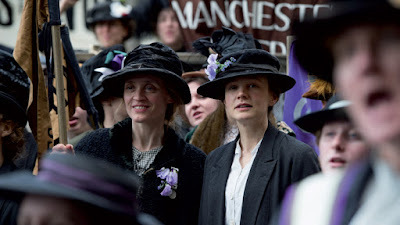 Overall then, SUFFRAGETTE is a good film, well acted and very well written that looks at a vitally important political movement from the ground up. It should be lauded not just from bringing a superb ensemble cast (both women and men) to our screens, but also for taking the unusual step of focussing on the working women who risked everything rather than staying with the well-known big-names. SUFFRAGETTE has a running time of 105 minutes and is rated PG-13. The movie opens in the UK on October 12th, Ireland on October 16th, the USA on October 23rd, Portugal on November 6th, France on November 18th, Hungary on November 26th, Spain on November 27th, the Netherlands on December 3rd, Greece on December 24th, Sweden and Turkey on January 15th and on in Germany on February 4th.